So, it finally arrived from the mail two weeks ago and I’ve been consistently playing it. First of all, don’t look for scores here. Ok, ok. If you want one, just read it up here instead of scrolling down: this game gets a 90%+. Happy? Fine. Let’s continue then. I found out about this game while scanning the now dead Danmakugata. I spotted some nifty glowy explosions and great colours so it quickly caught my attention. I visited the developer’s site and found out an updated trial version that came out during C73 (Comiket) with improve performance and such. Since then, I have been literally CHAINED to this thing and felt overjoyed when I read the release date was actually before the madness of C74. I quickly bought it as soon as I had the chance. Can’t stop playing it. What is Diadra Empty? The game is a horizontal ‘free roaming’ shooting game, ergo, STG/shmup. You have a decently sized battle area where you can fly freely around. Just picture a 2D Omega Boost and you get the idea. It has beautiful 2D backgrounds with some 3D components but everything is done purely on sprites and excellent effects. The game also runs at 1024×768 and, sadly, there is no option to change this. Blame it on all the next-gen crap that is being sold to us. The game clearly looks great for the usual doujin ‘standards’ (lies, because there is no real standard and many doujin games are usually way better than a lot of full-commercial mainstream stuff thrown at people) and it’s incredible to see this is made by just one person. Also notice the author, icewind, has a wicked sense of humor with some Pedo Bear references… Don’t ask me, it might be a joke towards the flood of loli-shooters and “cute” stuff cluttering everywhere. Jokes aside, let’s quickly resume what the game is about: shoot down as much as you can as quickly and efficiently as you can. And don’t die. Easy, huh? Not a chance. Enemies can and will get really though, spewing insane amounts of bullets and, if your computer can handle it, at full 60fps. You have intended slowdown options for those who get crazy at fast bullets but getting bombarded by 1k bullets at 60fps is a sight to behold. This leads me to what I love from this game: size. Things only get bigger, meaner and greater till a gigantic, epic, amazing ending. And even then, you unlock a harder play mode with bigger stuff. And what comes next? Extra levels that multiply the bets and put you against… well, you have to see it. The game can be purchased from the online stores mentioned there but White Canvas seems to be the only one shipping internationally. Himeyashop doesn’t seem to have it in stock and Paletweb quickly sold it out. There might be a chance to purchase it online through Melonbooks with an international credit card though. Note: I’m still working around the scoring system and such. Or the fact that you have a shield system to ease the pain of navigating around 2k bullets… It doesn’t make it any easier though, especially if you are sick enough to disable the Cave-like slowdowns and face everything at full speed. This is a replay from Chapter 7 in “True” Level (hard). That alone proves the game is freaking amazing. Writer, editorial consultant and multi-everything of doujin production circle Primum Soft. Esta entrada fue publicada en Doujin, Games, PC, stg/shooter/shmup y etiquetada diadra, Doujin, empty, frozenorb, game, horizontal, icewing, PC, shmup, shooter, stg. Guarda el enlace permanente. 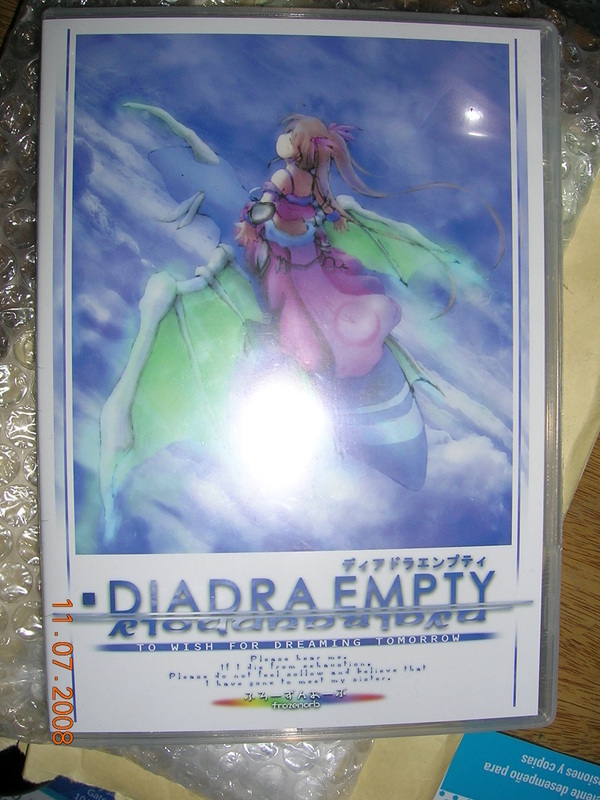 Hello, there, I’m really interested in Diadra Empty, but I can’t find any legitimate copies to buy. (I live in the US). Can you offer me any advice? Also, what’s the difference between PLUS and LW? Hi, I replied to you via Youtube. Development Patreon opening up soon! Comiket 93 report coming soon!